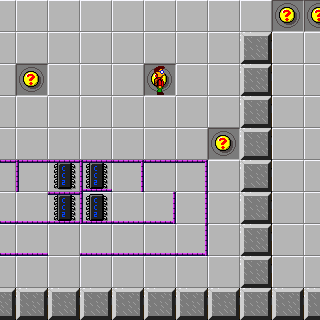 Lesson 2 (CC2 level) - The Chip's Challenge Wiki - The Chip's Challenge Database that anyone can edit! 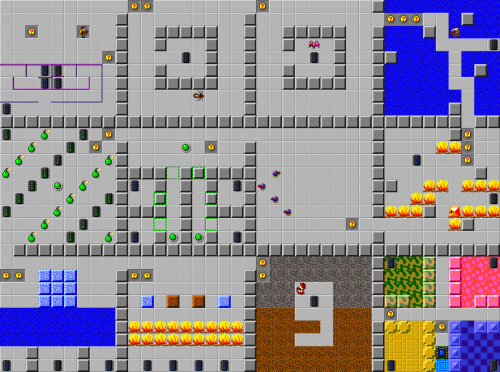 Lesson 2 is the 9th level in Chip's Challenge 2, and the second of the lesson levels. It was created by Chuck Sommerville. You will have to collect all 50 chips on this level to pass the chip socket at the end. Be careful! There are monsters on this level. If you hit one, you will die. Grab the chips in this maze of thin purple panel walls. The ant hugs the left wall, tracing the path along the side of the wall. You are safe as long as you don't get in his way. The centipede hugs the right wall, tracing the path along the side of the wall. The glider can cross water, while other monsters fall in and drown. The glider will go straight until it hits something. It will then try to turn left. If it can't turn left, it will turn right. Otherwise it will turn around. The fire box can cross fire, while other monsters avoid fire. The fire box will go straight until it hits something. It will then try to turn right. If it can't turn right, it will turn left. Otherwise it will turn around. The purple balls bounce back the way they came if they can't go straight. The green toggle button opens and closes the green toggle doors. The green toggle button changes these green chips and green bombs to their other state. Green chips and green bombs count towards your chips left needed to pass the chip socket. When you push an ice block into water, it makes an ice patch. Push these ice blocks into the water to build three bridges. More than one ice block can be pushed at a time. When you push ice blocks into fire, they melt into water. Push the ice into the fire to make water, then push the dirt into the water to make a dirt bridge. Monsters are stopped by dirt and gravel. The red teeth always move toward you. Lure the teeth into the dead end. These special colored floors and walls are just for decoration. Congratulations! If you have all the chips, then you are done.